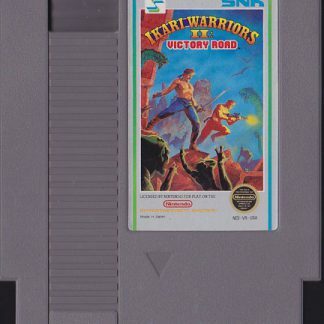 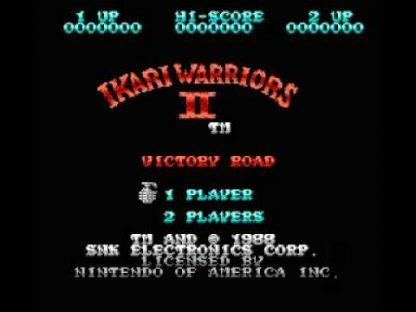 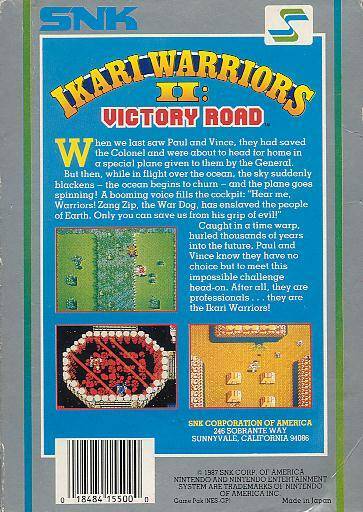 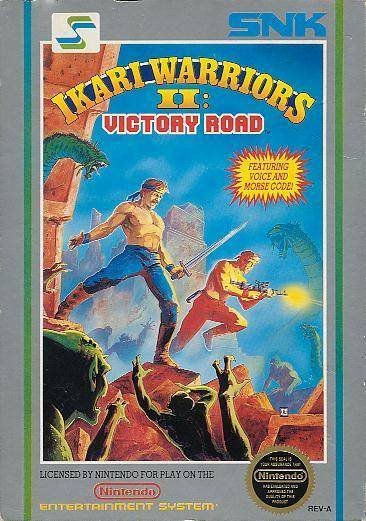 Ikari Warriors II: Victory Road was released for the NES in 1988 and is a direct sequel to Ikari Warriors, taking place right where the first game ended. 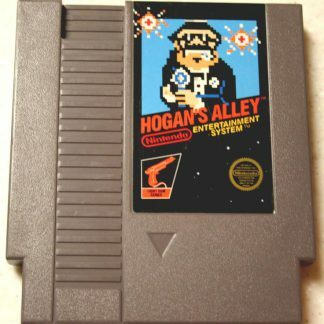 The goal is to destroy villain aliens using weapons and grenades. Vince and Paul are congratulated by the general, Kawasaki, for saving him and then return to their country by plane that was arranged by Kawasaki. 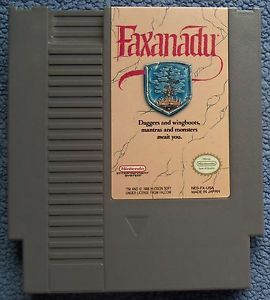 A storm appears out of nowhere and sends them into the future thousands of years. An alien meets them and tells them that Zang Zip, a villain, has conquered the land. 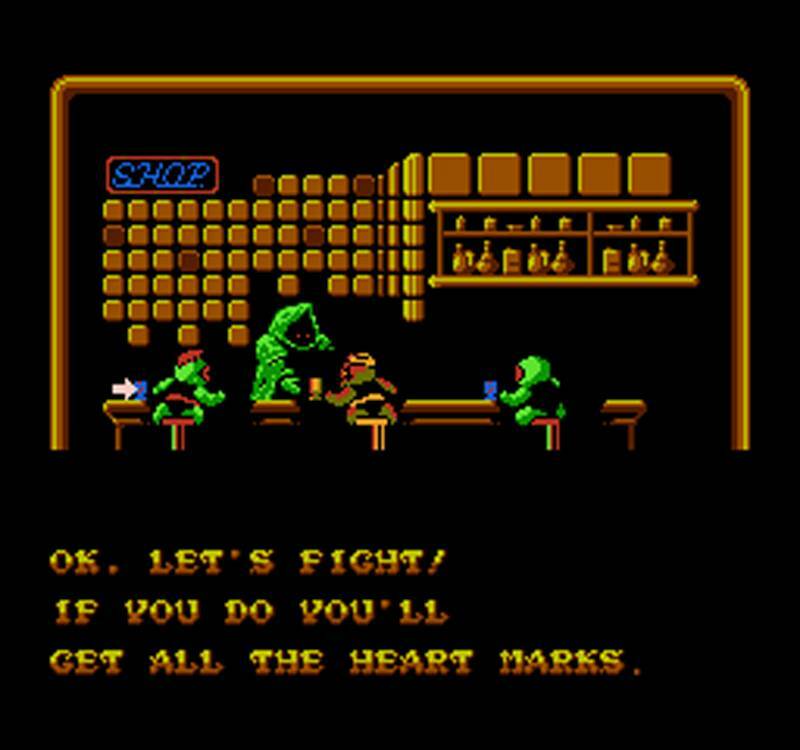 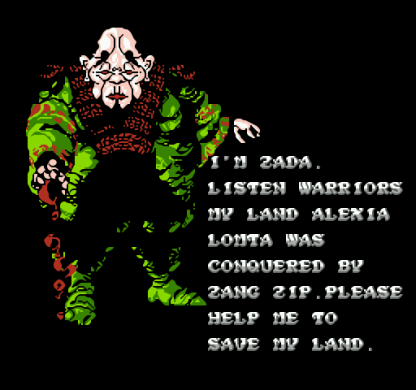 The NES game added a currency feature, which was called zeny. 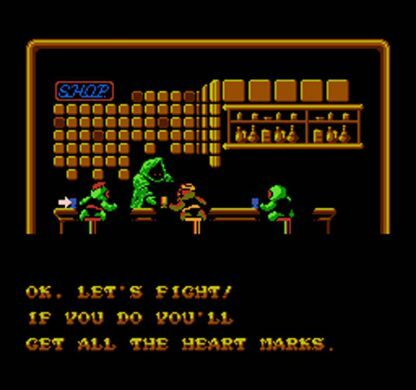 The player collects zeny and spends it at a shop to get better weapons and armor. 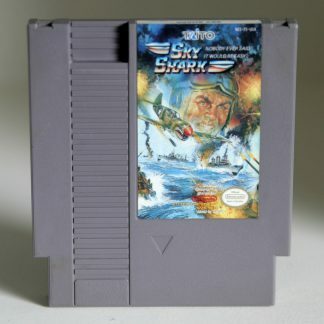 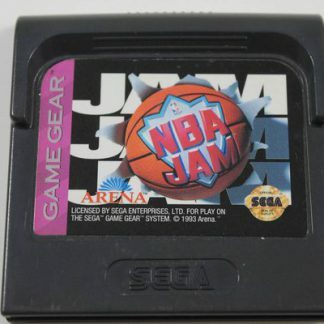 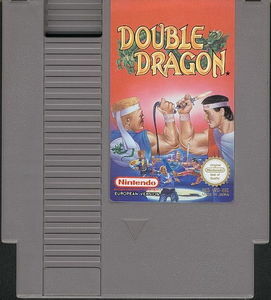 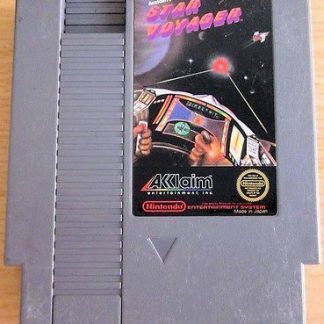 This version also emulates the arcade controls by locking your character in a direction you were facing when the fire button was being held down. 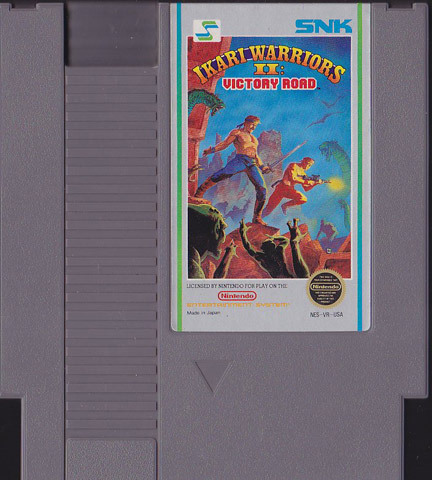 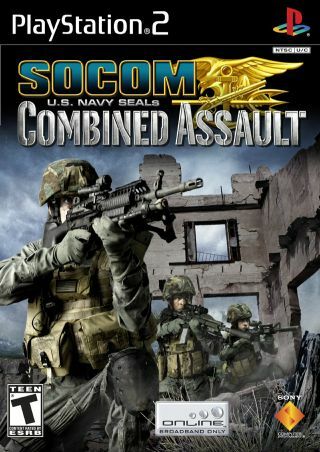 Also in this sequel, weapons had unlimited ammunition. 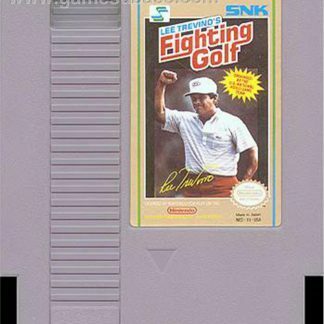 Players start out with flamethrowers, but will change to a machine gun when a life is lost. 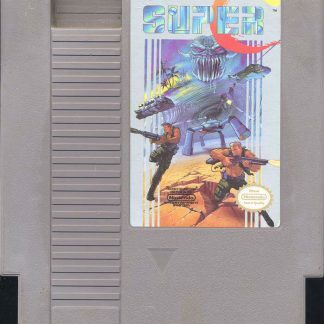 Powerups for weapons are spread around the levels usually hidden under a rock that can be destroyed with a bazooka or a grenade. Vehicles are absent this time around, but was replaced with armor. 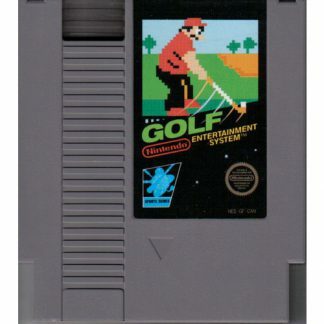 The weapons available in the game are a flamethrower, machine gun, red machine gun, boomerang, sword, black grenades, and red grenades.